We love our pets. They’re more than just pets; they’re full-fledged members of the family. And just like the rest of the family, you may not love the mess they make at home, however, unlike the other members of the family, you can’t ask them to clean up after themselves! 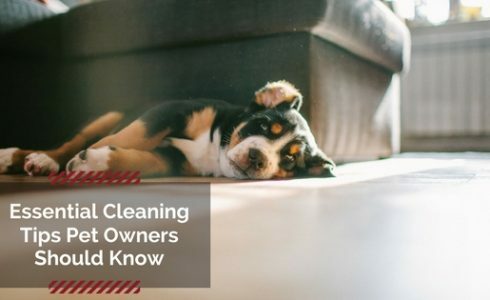 Keeping your home clean can be challenging when you add pets to the mix so we’ve gathered the essential pet cleaning tips to keep your space in its best shape. You will need lint rollers in your life. Even with the most ardent brushing and grooming routine, fur will inevitably get everywhere. Keep a few lint rollers on hand in several sizes, with the larger ones at home to pick up fur from clothes, furniture, fabrics and pillows, and a smaller one in the car for last minute touch ups. That way, you don’t have to drag out the vacuum to do a quick spot clean. Accidents happen so it’s important to spot clean messes as soon as possible to limit staining and odors. Use paper or old cloth towels to clean up the bulk of the mess (blot don’t rub!) and then clean the area thoroughly. You can make your own pet-friendly stain remover with equal parts white vinegar and water and adding baking soda to neutralize odor. Or you can use an enzyme-based cleaner to reduce smells. Dog beds come in all shapes and sizes but resist the urge to buy the overly cutesy one in favor of something that’s water-resistant and easy to clean. Pet beds should be washed regularly, at least once a month if not weekly. Keep the bed smelling fresh between washings by either placing a dryer sheet inside an envelope under the bed or sprinkling baking soda in the fabric. Don’t overlook their collars and toys! You can wash most collars in the washing machine but otherwise wash the items by hand and allow them to air dry in the sun. One of the messiest times can be mealtime. Keep the mess to a minimum and make cleaning up a lot easier for you by placing placemats under their bowls. This keeps the food on the placemat and off your floors. If your pup is an excessive drooler, consider using a doggy bandana. Not only will bandanas keep drool off their fur and your furniture, they’re also a very adorable accessory. Simply toss the bandana in the laundry to clean. Cats can be fastidious and will refuse to use a dirty litter box. Be sure to scoop the litter daily (or more, depending on the number of cats) and deep clean and change everything weekly. You can take the same approach for other small caged pets. It’s dirty outside and dogs somehow manage to bring home half the dirt. Keep muddy pawprints at bay by keeping a towel and a shallow container of room temperature water by the door so you can wipe their paws after returning from a walk. You can even train your dog to wait by the door after returning. Pet wipes is another handy item to keep on hand as well (this can be especially helpful for shorter dogs, like corgis or dachshunds, who may gather dirt on their bellies. Prevention is the easiest route. Make it part of your routine to regularly brush your pets fur to remove loose fur (yes, cats too! Doing so can help cut down on hairballs). It’s also recommended to frequently bathe your pet on a weekly or bi-weekly basis. These essential pet cleaning tips will help keep your pet-friendly home clean.